Zombies Chronicles Edition of COD Black Ops 3 on the PS4 and Xbox One dropped to $13. Pick up a copy with free store pick up. New historic low price. The average price for this game in the past 6 months is $13.49. 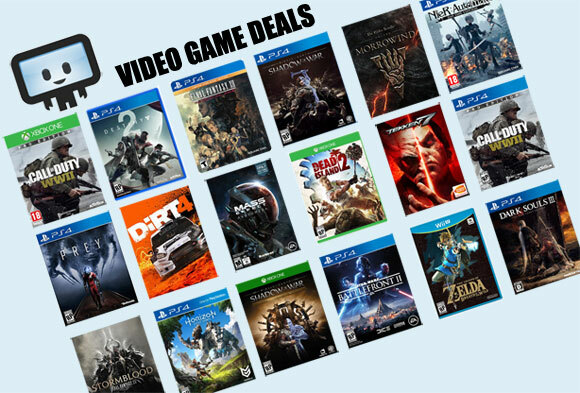 The game first became 50% off on May 20, 2018 at Best Buy. Lowest historic price was $12.99 on Mar 11, 2019 at Walmart. The average price for this game in the past 6 months is $18.99. The game first became 50% off on Nov 22, 2017 at Microsoft. Lowest historic price was $12.99 on Mar 11, 2019 at Walmart. New low by $3 on Call of Duty: Black Ops 4 on Xbox One. Deal's only good until the end of tomorrow. The average price for this game in the past 6 months is $37.68. The game first became 50% off on Dec 14, 2018 at Best Buy. Lowest historic price was $21.99 on Apr 15, 2019 at Microsoft. The average price for this game in the past 6 months is $38.58. The game first became 50% off on Dec 14, 2018 at Best Buy. Lowest historic price was $24.99 on Feb 2, 2019 at NewEgg. Best Buy puts a 50% discount on Black Ops 4 today. Multi-Platform (PS4, Xbox One, and PC) have dropped to $30. GCU members gets an additional 20% off which cuts price down further to $24. Missed the 50% off deal on Black Ops 4 during pre-Xmas sale at Best Buy? Walmart still has the game on sale for 42% off. For the Xbox One copy, GameStop has the same price. Both requires $35+ to get free shipping but you can order online to secure a copy and pick-up in store. Console gamer looking for a deal on Call of Duty Black Ops 4? Today, Walmart has the PS4 and Xbox One down to $37. New historic low price. Black Friday price on Black Ops 4 has arrive early :) - you gotta love competition as Amazon and Walmart are in a price war, now both retailer has the game on tap for $40 - a new low for all platform (Xbox and PC available too). Scoop up the latest battle royale title for 33% off - Walmart's advertised Black Friday price a week before Black Friday. We think Walmart is the way to go given they give free 2-day shipping and Amazon will require Prime membership. Awesome deal on Black Ops 4 from Newegg's eBay page. $10 off a recently released and popular title? No brainer. Perfect given Best Buy GCU's defunct and for those without Amazon Prime. If you're itching to try out Blackout, this is a pretty good deal well before holiday sales rolls around. Black Ops 4 is now at a new low price of only $20 at Newegg for the PC digital code copy. If you want to give their Battle Royale mode a spin, this is the cheapest way to go. Note that while this is a Battle.net key, you'll still have to wait for the physical card to be send to you from Newegg. Black Ops 4 for the PC (Battle.net key) is now only $34 at GMG in their Winter Sale. This is the lowest ever price we've seen for the digital copy from a legitimate retailer. The PC "physical" copy was on sale for $30 at Best Buy about two weeks ago before Christmas, and if you missed that PC deal on Black Ops 4, this is the currently the best deal online. Editor's Note: This is a Battle.net key and not a Steam key. Black Ops 4 for the PC will be released as a Battle.net only title, so you won't find it on Steam Store (similar to what Activision did for Overwatch). The average price for this game in the past 6 months is $44.66. Lowest historic price was $34.31 on Dec 29, 2018 at Green Man Gaming. Black Friday and Cyber Monday may be over but GMG is still offering Black Ops 4 for 31% off. This beats out the much smaller 20% off discount on Battle.net during Cyber Monday just earlier this week. Still available! Call of Duty: Black Ops 4 is on sale for 30% off at GMG for the Battle.net key. The same key is on sale for a smaller 20% off on Battle.net, making this a clear reason to go third-party retailer. If you can't wait for a deal on Black Ops 4 at Walmart, Target, Best Buy et al. for the PC discount - GMG has the Battle.net key on sale for about 26% off. Make sure you use the generated coupon at this page to get the deal. Pre-order deal on Call of Duty Black Ops 4 hits 15% savings on next week's October 12th release. Deal also available in Digital Deluxe Edition - which comes with the Black Ops pass, bonus items and Call of Duty points. Note that these are Battle.net keys and are NOT Steam keys. If you enjoy COD 4's Battle Royale mode during open beta, this is a solid deal. The average price for this game in the past 6 months is $7.80. The game first became 50% off on Nov 25, 2011 at Amazon. Lowest historic price was $7.80 on Nov 21, 2018 at Green Man Gaming. Call of Duty: Black Ops hits an all new low by $3 today in GMG's VIP gaming sale. Game's been out for almost five years now, but very rarely seen below $20. At GMG you'll need to sign in or create an account before you see the discount. Nice price on the PC version of Black Ops thanks to a deal from Newegg. If you're a CoD fan, Black Ops is an okay addition to the franchise. If you're a FPS fan, Black Ops is passable (hey, just telling you like it is). is this for pc? it says black ops for Mac. Published by Activision and developed by Treyarch, CoD: Black Ops II is a classic first person shooter in many respects but unique for the Call of Duty series. Most fundamentally, it's the first in the series to let player choices influence the story arc the game follows. As such, there are many endings a player can arrive at, adding an element of unpredictability and authenticity to the game not present in previous offerings. Despite some dissatisfaction with ally AI in Strike Force play mode, reviewers by in large gave Call of Duty: Black Ops 2 stellar evaluations.